Background: After the detection of recurrent high-grade glioma, there are no standard approaches; salvage surgery, chemotherapy and radiotherapy are often used despite the fact that no real clinical benefit has been confirmed and the combination of these approaches has not yet been fully investigated. Objective: In the present retrospective study, we reported the results of a mono-institutional experience studying the association of salvage hypofractionated stereotactic radiotherapy in combination with bevacizumab in patients with recurrent glioblastoma after standard up-front therapy with the Stupp protocol. Method: From May 2010 to December 2016, eight patients with recurrent glioblastoma were treated with hypofractionated radiotherapy 25 Gy in 5 fractions in combination with bevacizumab at the University Hospital of Pisa. Results: All patients showed appreciable improvements in Karnofsky Performance Status and median survival following the beginning of radiotherapy treatment to 7 months (range 3–15 months). Severe toxicity has not been recorded. 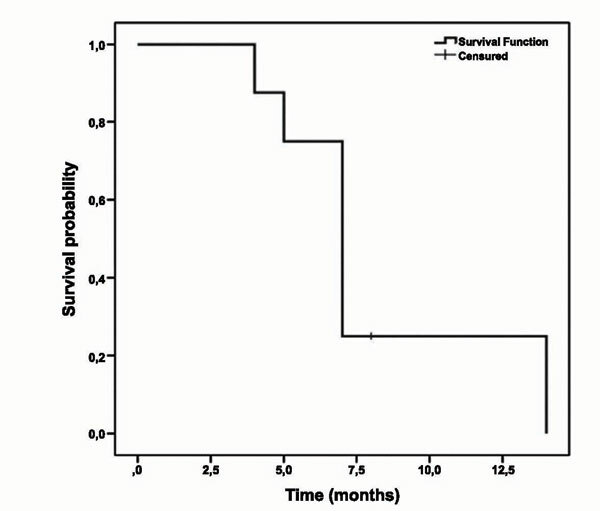 Conclusion: Hypofractionated radiotherapy associated with bevacizumab may represent a valid therapeutic option in selected patients with recurrent high-grade glioma. Recurrent high glioma, salvage stereotactic radiotherapy, bevacizumab, concomitant therapies, salvage surgery, glioblastoma.